I have no intention of spending $850 on a piece of plastic, but wouldn't this trench by Wanda Nylon be wonderful on a rainy day? It's the wearable, mod equivalent of a bubble umbrella! Here's hoping one of the fast fashion chains comes out with a knock off before summer thunderstorms roll in. Makes me think of Blade Runner! You'd better be wearing some amazing underneath that!! No more hiding under a trench haahhaa! @Cloud of Secrets … it was one of our maine references indeed ! Thanks for stopping by, @Wanda Nylon! I'm pretty sure Topshop or even Zara will do a knockoff, it's similar to the Valentino one that they did as well. Um I love this!! When you find the knock off please let us know! 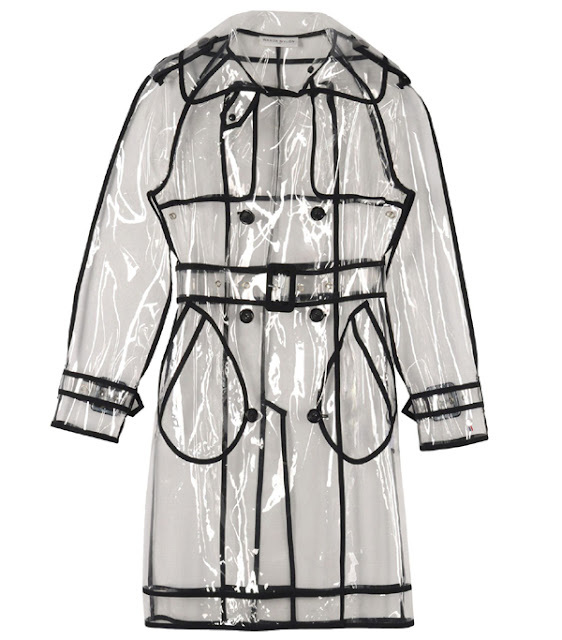 The clear trench is an iconic wardrobe stapple since the 60s. We decided to first relaunch it in its pure version & in top notch quality (every stylist we work with says the quality feels different and the fit is great) and are now reinventing this, always with the aim of keeping it soft, supple & recyclable and it comes out 10 times less expensive than Valentino, which we thought looks great also. Thank you for commenting, @Wanda Nylon! You're point of view is always welcome.